William Willis, Sr. has just traded New York City for the sleepy town of Finch in the Cotswolds so he can be closer to his son Bill, his daughter-in-law Lori, and his twin grandsons. But instead of purchasing a cozy little cottage of the Cotswold variety, William purchases Fairworth House, a large, 10-acre estate that requires major renovations. Since William is unable to manage the entire estate on his own, he hires two live-in housekeepers, a married couple from Ireland named Deirdre and Declan Donovan. When Deirdre and Declan prove to their employer that they excel at their jobs, Lori feels that the couple seem too good to be true, and can't help but wonder if they have an ulterior motive. Plus, shortly after the housekeepers' arrival, William and Lori note that random historic objects from the house are continuously being shuffled around and misplaced. Then, an old painting from the old Fairworth barn is stolen from the restoration artists, and Lori is set on blaming the Donovans. Are the Donovans really as amazing as they make themselves out to be, or are they running a sinister scheme? 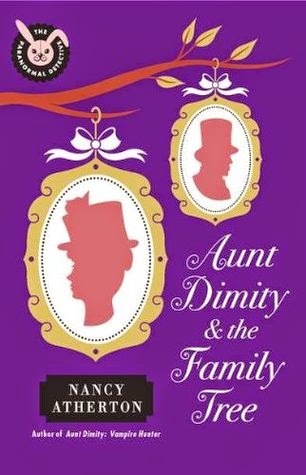 If you know anything at all about Aunt Dimity and the village of Finch, you should already know that not everything and everyone is as they originally might seem. Nancy Atherton's prose is unbelievably beautiful, and perfect for the cozy mystery genre. Atherton is highly underrated in the mystery genre, and writes in a manner so poetic and lyrical that it instantly sets you at ease, which is why I like to describe her books as the ultimate cozy mysteries. Nothing invokes that comfy tea-and-scone atmosphere quite like an Aunt Dimity book. I loved all the characters in this one, including the Donovans, and was highly entertained by the hilarious sub-plot featuring local townswoman Sally Pyne and her eccentric Latino lover from Mexico. William agrees to allow Sally to temporarily pose as a wealthy woman who owns Fairworth House for the sake of impressing and retaining her beau. Good stuff. The novels that follow Aunt Dimity and the Family Tree in this series are Aunt Dimity and the Village Witch, Aunt Dimity and the Lost Prince, Aunt Dimity and the Wishing Well, and Aunt Dimity and the Summer King.